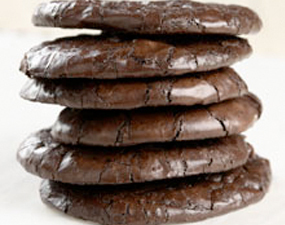 Ultra-chewy, rich chocolate cookies with no added fat? And no gluten? Impossible! But it’s true: these flourless chocolate cookies get their texture from egg whites, and their flavor from cocoa powder (which represents the only fat in the recipe). Plus they’re easy to make: Just stir together a few simple ingredients, scoop onto a pan, and bake for 8 minutes. You won’t believe the delicious result. 1) Preheat the oven to 350°F. Lightly grease two baking sheets. Or line with parchment, and grease the parchment. 2) Stir together all of the ingredients till smooth. Scrape the bottom and sides of the bowl, and stir again till smooth. 3) Drop the soft, batter-like dough onto the prepared baking sheets in 1 1/2″ circles; a tablespoon cookie scoop works well here. 4) Bake the cookies for 8 minutes; they should spread, become somewhat shiny, and develop faintly crackly tops. 5) Remove the cookies from the oven, and allow them to cool right on the pan. 6) Yield: 16 large (3″) cookies. Serving Size: 1 cookie, 28g Servings Per Batch: 16 Amount Per Serving: Calories: 88 Calories from Fat: 5 Total Fat: 1g Saturated Fat: 0g Trans Fat: 0g. Cholesterol: 0mg Sodium: 47mg Total Carbohydrate: 19g Dietary Fiber: 1g Sugars: 16g Protein: 2g.